Arriving at her studio in the East End of Glasgow, we already felt the cool, quirky and creative vibe rubbing off on us. Breakfast and coffee down, it was time to begin preparing the products and props to allow the shoot to being! The outcome is incredible and we cannot wait to share the photos with you but in the meantime, click here to see a sneak peak! To see more of Beth Chalmers work click here! I do not leave the house without my planner, its ridiculous. I left on a trip once without it and I felt naked. Horrid, horrid, horrid – never again. So why the addiction? It helps me plan out my day according to what I want to feel, it gets my core desired feelings up close and central for me in my day to day focus. Time at the start of the day with my planner causes me to stay still enough for long enough to reflect (with the beautiful internal quotes) on what happened and focus on what will be. The graphics are delish and you can feel that it is pulled together by someone who loves stationery. And goooooood stationery. It is an absolute joy to be able to travel with our work and more often than not we find ourselves in the delightful surroundings of the Citizen M hotels. This week, we are very lucky to be kicking off our Monday at one of the booth desks in the brand new Citizen M Tower of London hotel. Having only opened it's doors to the public last week, there is a lovely brand new feel to everything along with an incredibly relaxing vibe. Throw into that the ever personable staff that make each visit to these hotels very special. We are firm believers in that, the space you surround yourself with on a daily basis massively contributes to your productivity, your mentality and general well being and therefore we always make sure we are in our happy place. Make each day a joy! And enjoy! Click on the links right here right now and you are gifted this beautiful lovely bunny filled discount. For our bunny good Easter discount - click here! We have been back and forth with our team to work on the rebrand. We have had many names and iterations however none felt right enough. We delved into who we are and what conversations we have to see if that would shine a light on a new brand. Frequently in discussions on leadership and coaching I say “and not or” when talking about some leadership paradox that exist. I am also a big lover of an ampersand. It’s a thing of beauty – its powerful, its extra, you are never alone with an ampersand. Clearly I say it a lot as we thought that the and needed to be part of the brand. Copper is delightful! Pop into our HQ and you will be startled by how many copper products we have, we could melt it all down and put a deposit on a house! Scribbles – well, we are known to doodle. No straight conformity in our doodles. All scribbles. And it had to be a 3. As the best things come in 3s. And so, as we put together the words &copperscribbles I wept. And that’s when you know you know. Then the design team got to work. And with a few tweaks to the original artwork they sent over – BOOM! A hum dinger of a logo. Any excuse for a notebook. We were more than delighted to be contacted about some beautiful stationery the other day and we cannot hold it back any longer. The beautiful people at daily greatness do the most beautiful journals. You may have seen them in Elle, Marie Claire and other beautiful publications as they are really quite delightful. Well thought through and really wonderfully packaged. 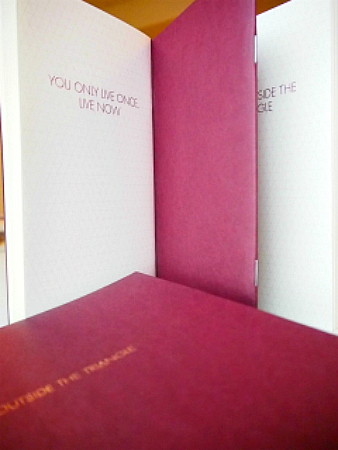 I shrieked with delight when my beautiful yoga journal turned up! We got a text the other day to say that envy and jealousy had arisen in a senior meeting, and that it was our fault. We weren’t even present in the meeting. And then it became apparent that we were – kind of – in the meeting. People were fighting over it. It got ugly. Whilst we do not condone violence (even though HQ is in Glasgow) we are rather delighted with this scenario. So, if you need to create a scene, if you find yourself not knowing the answer in the meeting. Throw an &copperscribbles notebook on the table.